BAKASSI—SOLDIERS of the Operation Delta Safe deployed to combat the Bakassi Strike Force, BSF, militants, who commandeered Akpabuyo and Bakassi Local Government Areas, Cross River State, few months ago, kidnapping and extorting money from villagers, have at last dislodged the terrorist group and restored tranquility in the troubled areas. For over eight months, the militants bullied villagers, traders and staff of the beleaguered local government councils adjoining the sea, and travellers who passed through the areas on daily basis. They also robbed, raped women, collected taxes, meted illegal justice and carried out several other atrocities in the name of militancy and freedom fighting. Many people became helpless and relocated to safer areas, while council officials, including chairmen and councillors, abandoned their work posts and took up residency in Calabar. Niger Delta Voice learned that the soldiers under the leadership Col N Muktar, commander of sector 4, covering Cross River and Akwa-Ibom states, ordered a day and night operations on the waterways, creeks and land where the militants were suspected to be hibernating. In the process, many militants were captured; several demobilized with cache of arms and ammunition confiscated. The sector commenced operations on September 1, but because of its style of smoking out the militants from their hideaways, they started seeking opportunity to surrender and be granted amnesty within few weeks of operations. Recently, troops of the sector also had a fiery gun battle with militants, leading to the arrest of a militant kingpin with his supply of arms and ammunition. A statement issued by the Operation Delta Safe headquarters, signed by its Commander, Rear Admiral Apochi Suleiman, said the troops of Sector 4 stationed in Calabar, led by Col N Muktar, responded to a distress call by traders, who were being waylaid by the militants at the Ikang creeks and when the troops arrived the scene, the militants engaged them in a fierce gun battle. 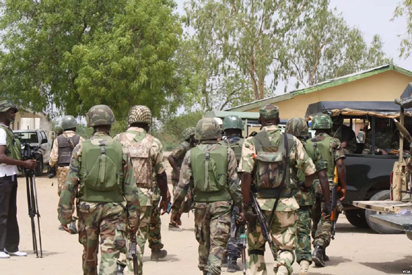 “Troops of sector 4 in Cross River State encountered militants at Ikang axis, who were robbing traders and engaged them in a gun battle and one of the militants was captured and a large cache of arms and ammunition was recovered,” it stated. The militants, Suleiman said, were heavily armed with gunboats, which gave them the effrontery to confront the Operation Delta Safe troops, but the superior fire power of the team subdued the militants, leading to the arrest of one of them, along with the arms and ammunition.